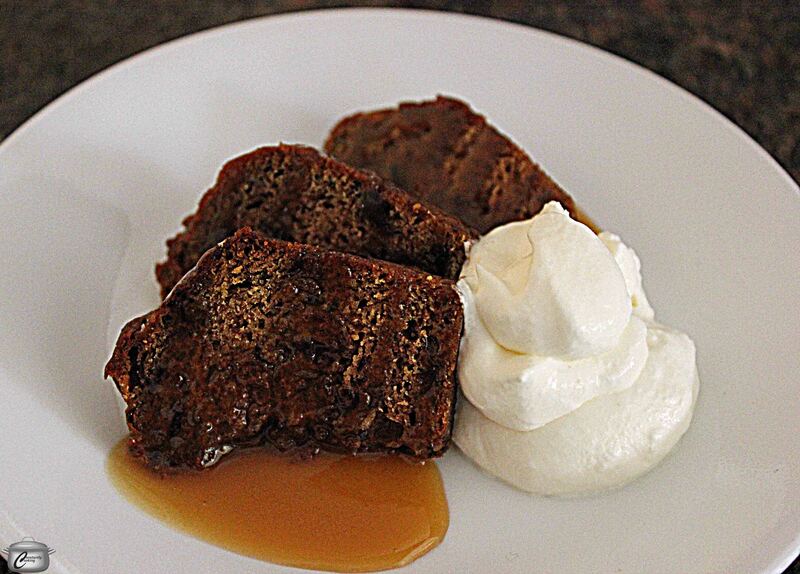 This cake is often referred to as Sticky Toffee Pudding, because of its British heritage (the Brits refer to desserts of all sorts as ‘pudding’). The name is appropriate because the cake is so moist and rich – almost as though it has pudding in it (but it doesn’t). While it is delicious on its own, don’t skip the toffee sauce – that’s what elevates it from good to spectacular. Both the cake and sauce freeze well so they are great for make-ahead cooks like me! This dense, moist cake tastes only subtly of dates and the toffee sauce gives it a sweet, rich finish. Preheat oven to 350F. Butter and flour a Bundt pan. Combine dates and water in a small saucepan. Bring date mixture to a boil, then reduce heat and simmer, uncovered, for 5 minutes. Remove from heat and stir in baking soda. The mixture will foam a little. Cover saucepan and set aside. In a medium bowl, combine flour, baking powder and ginger. Set aside. In a large bowl, beat sugar and butter together with a mixer on high speed until the mixture is light and fluffy. Gradually add the flour mixture, beating on low speed until just blended. Stir in the date mixture until just blended. Put the Bundt pan in a roasting pan or large baking dish and add boiling water to come halfway up the sides. Bake approximately 35 – 40 minutes * until the cake is a deep golden brown and a skewer inserted in comes out moist but clean. * Bake 30 minutes in the hot water bath and then remove it from the bath for the final 5 – 10 minutes of baking. Cool on a rack for 10 minutes. Turn out the cake and invert it onto a rack, to cool slightly. Serve warm or at room temperature, pouring a generous amount of warm toffee sauce over each piece and adding a dollop of whipped cream. Serves 10 or more, depending on how big you like your pieces of cake. I like to cut several small slivers and fan them out on the plate so each piece gets coated with sauce. Melt butter in medium saucepan, over medium heat. Add brown sugar, stirring occasionally until dissolved. Add cream and increase heat to medium-high and boil gently, uncovered, stirring occasionally until slightly thickened, about 5 minutes. Transfer to a microwave-safe jug and reheat just before serving. This entry was posted in Baking, Desserts, Recipes and tagged Bundt, cake, date, pudding, sauce, sticky, toffee, whipped cream. Bookmark the permalink.